Self-proclaimed "sandwich hater" is turned into a believer! Want to read more about this delicious sandwich from Light Bistro in Ohio City? Check out my guest post on The Cleveland Sandwich Board! Our recent little find in Tremont is A Cookie & A Cupcake. While my waistline won't thank me for finally stopping in this neighborhood bakery and shop...my tummy sure does! 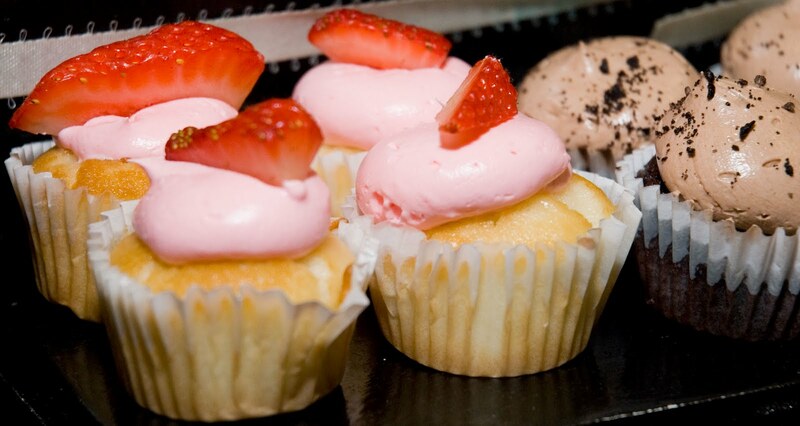 I've had samples of their mini-cupcakes at a couple of recent tasting events (see left), and I was always impressed with how moist and fresh they were. I'm here to tell you that they are even better from the store! "R" and I stopped in there on Saturday for the second time (in one month, ugh). With a mouth full of cupcake, "R" exclaimed "I want to run back in there and hug the women who made these". At least that's what I think he said through all of the crumbs and frosting that were taking up most of his mouth. We had the Strawberry, German Chocolate, Apple, and Espresso cupcakes. The Apple cupcake was topped with traditional apple pie filling with a shot of cinnamon frosting hidden in the center. I discovered that all of the cupcakes we tried had something tucked away in the middle of the cupcake. They were like tiny explosions of flavor once you got to the center! The Espresso cupcake was a moist, chocolate cupcake with a hint of coffee flavor. This was my second time trying the Strawberry. I previously thought that the white cupcake with light strawberry frosting was my favorite. But then I tried the German Chocolate. The rich, chocolate cupcake was filled with a delicious chocolate and coconut filling in the center, which was a perfect little surprise. I will certainly be getting this flavor again! Their cupcakes may be making a big splash all over Cleveland, but they make much more than cupcakes. There are cookies too...and brownies, cheesecake, and beautifully decorated custom cakes. I'm talking about Food Network-worthy cakes. The designs photographed on the walls are just spectacular, and they are screaming for me to have a special occasion! If you haven't already heard of A Cookie & A Cupcake, then seriously consider checking them out. This is coming from a girl who will always pick salty over sweet. But they have tickled my taste buds and made a fan out of me. P.S. I really hate the word "moist", and I can not believe that I wrote that word as many times as I did in this post. But they really are...moist! 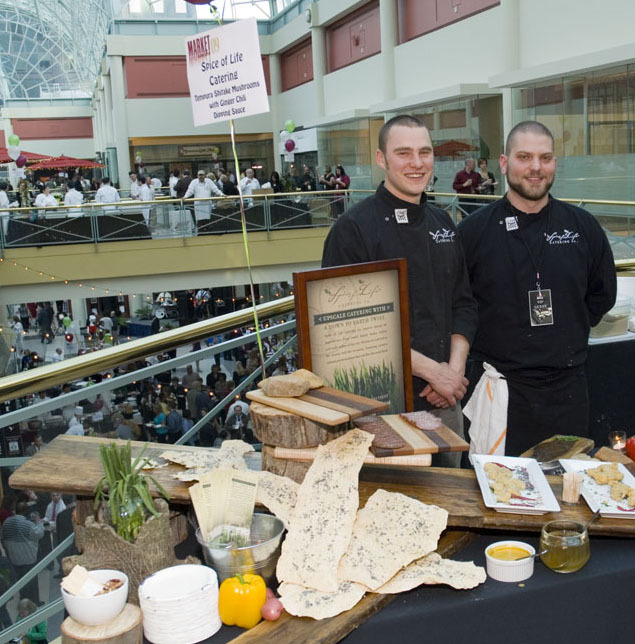 One week from today, over 50 local chefs and assorted beverage purveyors will convene at The Galleria at Erieview in downtown Cleveland to support the Cleveland Foodbank's Harvest for Hunger Campaign. The annual food and funds drive allows four area food banks to provide FREE food to local hunger centers in 21 counties. The Cleveland Foodbank serves more than 450 hunger centers in a six county area, and just $1 donated to the campaign provides enough food for four nutritious meals to struggling men, women, and children in Northeast Ohio. 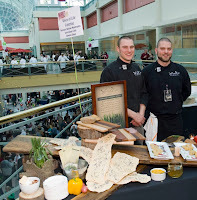 For just $85 (340 Meals), you could be enjoying samples from some of the best restaurants in the Cleveland area on Thursday, April 22nd from 6-9 p.m. at Market Under Glass. Some of my fellow fabulous bloggers have been talking about this event because they will be there as "celebrity servers"- paired with a restaurant station for one hour of the event to meet and mingle with guests. Don't you want the chance to meet Alexa from Cleveland's A Plum, Charity from I Heart Cleveland, Cara from iCarabout, or Allison from Confessions of a Cohabitant? They have had some great posts about the event recently, and one lucky reader of each won tickets in a giveaway! But I have the information that you really want to know...what the restaurants will be serving! ...plus many luscious desserts, wine, beer, and more! For more information or to purchase tickets online, click here. Don't miss this fabulous local food event- all for a very worthy cause. Allison from Green Dog Wine coordinated a blogger meet up last night at Johnny Mango's in Ohio City. It was my first meet up- so consider my cherry popped! We had a fabulous time talking "blog", eating/drinking, and sharing life stories. Umm...can you say "yummy margaritas"? My head sure did today. Our server, Matt, was fabulous and treated us very well. We were a table of 11 very talkative and loud chicas, and we couldn't have been easy to handle with our outspoken personalities and separate checks. So for that...I thank you Matt. No one in my life blogs. Some of my friends fake interest, and until two days ago "R" had never even seen my blog. Allison- your meet up inspired me to make him take a look. I wasn't kidding when I made the statement at our table that "It is awesome to be in the presence of people where it is socially acceptable to immediately whip out your camera as soon as your food arrives." Usually, "R" will say "Ugh, is that for the blog?" (the word blog in that statement is said with disdain). People just don't "get it" unless you do it. Hanging out with these lovely ladies was refreshing and much needed. 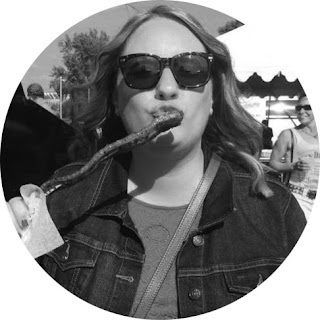 I write this blog because I am passionate about Cleveland and what our fabulous independent restaurants are doing. To spend time with people who understand that passion and the pleasure that comes from writing a blog was just what the doctor ordered. Looking forward to our May meet-up, and we'll all have to work on our "stories" to keep up with Monica On the Go! "What's the catch? That's what everyone first asks when we invite them to sit down for a free lunch, " states Executive Chef/Partner of Spice of Life Catering Co. Ben Bebenroth. "The Cleveland Renegade Lunch Project, founded in 2009, offers 20 passers-by a chance to sit down together at elegant dining tables in the center of a busy building or intersection for a free two-course lunch. The lunches are held in a different, impromptu location each month and each features a different charity to raise money and awareness for a Cleveland community cause. At the end of each event, a hat is passed and guests are asked for a donation in exchange for the lunch. No gift is too small or too large and everyone is welcome to give as they can. The meals are prepared tableside by Chefs Mike Smith & Ben Bebenroth of Marigold Catering and Spice of Life Catering Co., respectively, and served by a professional service staff on china, glass and silver." I have had the pleasure of attending three Renegade Lunches over the past two years (including the Launch Party where we helped the staff come up with ideas for fun high-traffic locations and worthy charities in our area), and I swear that there really is no catch. All that they ask in return for a free, fabulous, gourmet meal is that you consider making a donation to the charity of choice for that month. These lunches have raised thousands of dollars for local charities, including $600 at yesterday's lunch to benefit Harvest for Hunger. The renegade lunch went a little off the beaten path yesterday, popping up on Concourse C in the Cleveland Hopkins International Airport. Airport staff and lucky passengers passing by Gate C4 were encouraged to take a seat and enjoy a two-course meal of blood orange, fennel and pecorino salad with bibb and mache lettuces, marcona almonds, and pomegranate vinaigrette & buttermilk fried pheasant with sweet potato puree and spring greens. The salad was light and refreshing, and I really enjoyed the pomegranate dressing. I was interested to try pheasant for the first time, and I found myself surprised at how moist it was. Also, I think I was expecting it to taste more "gamey" than it did. Bebenroth shared some great stories with the diners about the local pheasant farm that supplies Spice of Life. His catering company is dedicated to building relationships with local farmers, and his menus are always tailored to the season with ingredients sourced from within a 100-mile radius of the city. The side of sweet potato puree was smooth and bursting with flavor. I mopped it up off my plate and barely left any behind! The fresh, crisp green beans served with the main course gave a nice hint of crunch to the dish. These guys certainly know how to produce an outstanding meal! I am pretty adventuresome with my food, but I seriously would consider trying anything and everything that these two amazing chefs whip up. If you are not already doing so, consider following them on Facebook to learn about upcoming Renegade Lunches happening once a month all over Cleveland. I'm sure that they would love to hear your location suggestions. Stay tuned...for I may be dropping hints of the next location as well. This is one lunchtime that you don't want to spend eating at your desk! "R" and I had the toughest time deciding where to brunch on Easter Sunday. There were too many good options advertised, and making the final choice was difficult. By Saturday night we still hadn't selected a restaurant, but after seeing the weather forecast we knew that a patio or deck was a requirement. Let me start this post by stating that we have dined at the Creekside Restaurant in Brecksville once before, and our lunch was very good. "R" still raves about the lobster quesadilla. But our Sunday brunch missed the mark. I ordered the Vegas Scrambler with three eggs scrambled, bacon, sausage, green peppers, onions, and spinach over potato skins topped with cheddar cheese sauce ($7.25). When my plate arrived, I quickly realized that "cheddar cheese sauce" meant nacho cheese- and the scrambler was swimming in it. Don't get me wrong- I love nacho cheese...on nachos, in a stadium. Not on my Easter Brunch eggs. I feel that there is no place for nacho cheese in any nice restaurant. It completely overwhelmed the flavor of the dish, and the wheat toast ended up being the highlight. It was really good bread! I will also mention that my side of fruit arrived with a hair in it. Yuck. "R" ordered the Breakfast Croissant with scrambled eggs, mushrooms, and spinach topped with brie cheese and served with fried apples ($7.75). I did get one tasty bite of a huge piece of brie, but I think overall "R" wasn't too thrilled with his dish either. Ok, the good stuff...the restaurant's outside deck overlooks the little creek running through Brecksville. With the sun shining, birds chirping, and my yummy mimosa on hand- it was hard not to be enjoying ourselves. So even though the food was kind of a let down, we had a great Easter Sunday morning spent in the sun. Hope that you did as well! I am going to let you in on a little secret. I have referenced it before, but it's time for a full disclosure...The best gyro in Cleveland can be found at Fergie's bar on Ridge Road in Parma. This hole-in-the-wall dive bar is producing the best gyro in our area, and very few people are aware of this hidden gem. I have learned over the past two years that Clevelanders take their gyros very seriously, and "R" has even attempted to seek out one better than Fergie's. His search took him to many stops, but each was a failure in his quest. My personal opinion is that it is all in the sauce. Their homemade tzatziki sauce is amazing, and blows others out of the water. Don't be put off by the location, size, or (lack of) atmosphere of the bar, this gyro is worth it! Dining Deals Alert- A gyro is under the $10 price point. Not in the traditional sense, of course, but he threw one hell of a "Girl's Night Out" party last night at Fahrenheit so I think that he earns the title. For $25 per person, we were promised "Two cocktails and fabulous food samples from Chef Rocco's New Spring Menu! Also, Banyan Tree and Salon Vie sweet treats to sample from. A Cookie and a Cupcake and Dove chocolates. Plus lots of fun, games, and giveaways like free haircuts, manicures, pedicures, Fahrenheit gift cards and more!" What we actually got, I think, was so much more! As guests arrived, we were literally given the red carpet treatment. A bag of goodies was handed to each woman as she checked in, and then we were encouraged to pose with our friends in front of a custom-designed hot pink backdrop. My friends luckily arrived early and were able to score a patio table- which was key on this gorgeous spring evening! As we sipped on fun strawberry puree "Victoria's Secret" martinis, servers walked around with trays piled high with some of Rocco's goods. We sampled chicken satay with a spicy peanut sauce, shrimp wontons, crab-stuffed egg rolls, calamari, crab cakes, cheese-filled pasta in a cream sauce, and more! The long buffet table inside was crammed with even more treats, including luscious desserts and cheese platters. The gorgeous stiletto ice sculpture pictured above sat majestically at the head of the buffet tables, and pink and silver balloons floated above our heads throughout the restaurant. While the food and specialty drinks were fabulous and flirty, the real highlight of the evening were all of the fashion and beauty stations scattered throughout the restaurant. As we wandered through, we had our makeup done for free, enjoyed a complimentary 5 minute massage from Lisa Gallagher Massage Therapy, picked up a coupon for $15 off a purchase at Amy's Shoes, watched women get their hair done by professional stylists for free (the line was too long to wait for our turn), and then we shopped at several jewelry and accessory stations. I picked up the most fantastic black flower ring from stella&dot. Rocco- you hit this nail on the head. The party was fabulous and ALL of the women seemed to be enjoying themselves. I didn't even mention yet that there was a stiletto competition and fantastic raffle prizes, such as dinner for 10 in your home courtesy of Chef Whalen. Sadly, I didn't win anything- but if this is an annual event then I'll be back to try my luck again in 2011! Thanks Chef- you are welcome to come with us on girls' night anytime!